Slugs are one of the most destructive pests in British gardens, it’s a constant battle to keep them under control as they can eat about twice their own body weight each day! Nemaslug® Slug Killer is fast gaining a reputation as the organic way of winning the battle against garden slugs, one application of Nemaslug® can provide up to 6 weeks protection and if you start applying early in the season, you can target the young slugs growing under the ground. Unlike chemical pellets, the nematodes continue to work well during wet weather - exactly when you need protection against slugs. 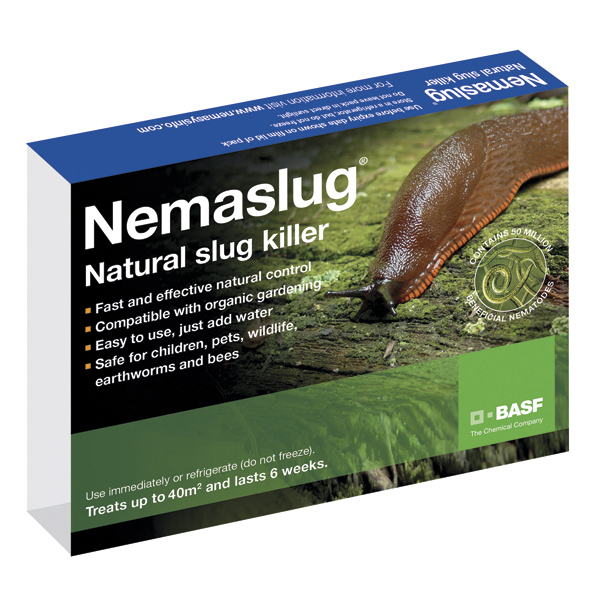 Nemaslug contains microscopic worms (nematodes) which seek out slugs above and below ground and stop them feeding on your plants within just 3 days. 1 application gives 6 weeks of control and this pack fills 4 watering cans and treats up to 40m² (50sq. yards). Nemaslug® products contain Nematodes (microscopic worms) which are renowned biological control products, providing many benefits over traditional gardening chemicals and are a key ally for organic gardeners. All products are simple to apply, and totally safe to use and harmless to children, pets, birds and wildlife. Please note: This item will be despatched at the optimum time for application. This is a live product only despatched to UK addresses.